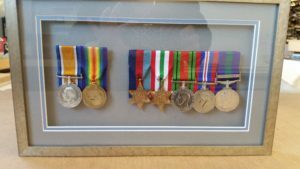 A number of customers have come to asking for frames to display their medals which allow them to be removed for the medals to be worn. This is what we came up with. 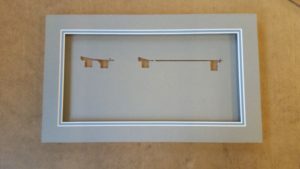 This is a box frame finished with real silver leaf which is perfect to set off the grey and powder blue mount. 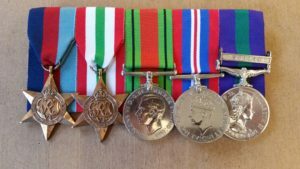 Our customer had two World War 1 Medals and five World War 2 medals. The ribbons were looking a little past their best, so before starting the framing work, we re-ribboned and court mounted the medals so they were looking much more presentable. Next we created a mount and drop mat to support the medals. A soft grey was chosen for the medals to sit on and for the top matting layer. 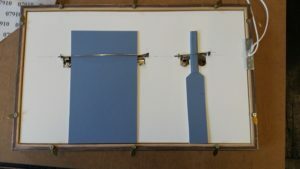 A powder blue was used to create a double mount with just 5mm of the blue on show. Foam board is fitted between the mount and the top mat to create enough depth to house the medals. Next comes the tricky bit. Lay the medals where they need to sit in the layout and with a pencil mark the position of the fixing pins on the back of each set of medals. 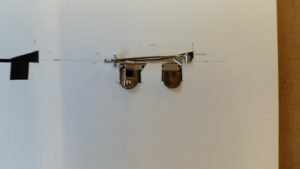 Then cut by hand with a scalpel two custom shaped holes to allow the fixing pins to pass through. These need to be cut carefully as these are going to locate the medals in place and will effect the overall appearance of the finished piece. Usually at this point lots of swearing and cursing ensues and probably tea and chocolate too! 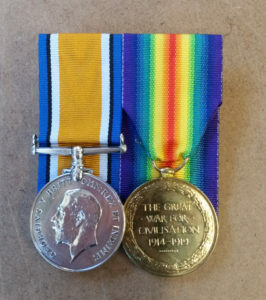 View of the medal pins from the back. Next cut two ‘keys’ from spare card to lock the medals in position before the frame is closed up. 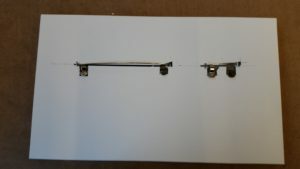 The frame is finished with turn buttons to allow for easy removal of the back to take the medals out. Thank you for reading my first post. Hope this was interesting.